Saturday February 11 1911 I did not feel very well. Got the dinner early for Will to go to town. I then washed out a dress and cleaned up the kitchen and and washed some windows. I tired the machined in the afternoon. I do not like it. Sewed some by hand. Read in evening to bed early. Sunday February 12 1911 I was busy with the work all morning. Mr & Mrs Weld spent the afternoon here I read all the evening. 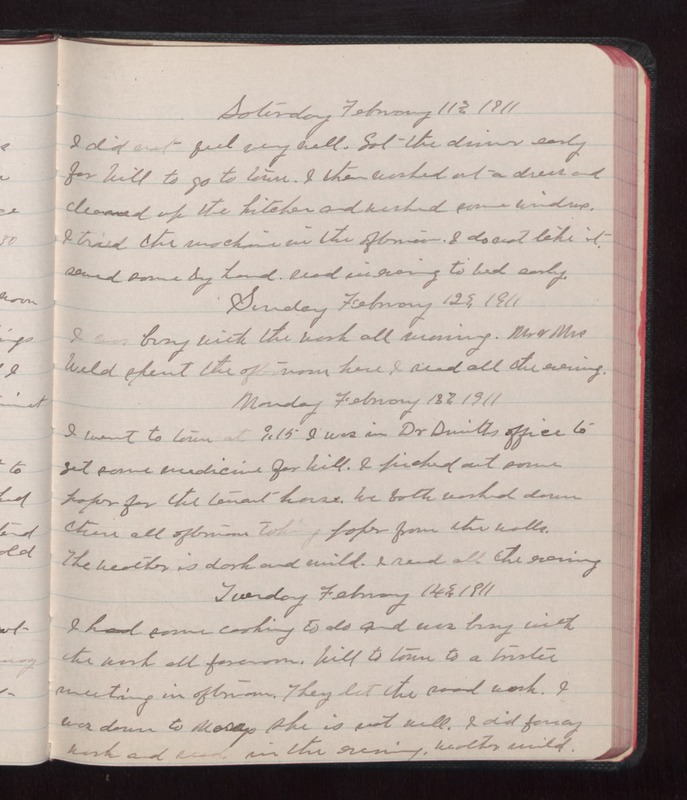 Monday February 13 1911 I went to town at 9.15 I was in Dr Smiths office to get some medicine for Will. I picked out some paper for the tenant house. We both worked down there all afternoon taking paper from the walls. The weather is dark and wild. I read all the evening. Tuesday February 14 1911 I had some cooking to do and was busy with the work all forenoon. Will to town to a [illegible] meeing in afternoon. They let the [road? seed?] work. I was down to Marys She is not well. I did fancy work and read in the evening. Weather mild.